I made this wallpaper on the very beginning of my career 7 years ago and the only thing what I remember from it, is that it was submitted exactly on my birthday, which is again today... Now in 2015, I have complety reconstructed it, just as I did last year with two other vector-based Di Gi Charat wallpapers, Princess School Homeroom and Powerful Summer. Once again the original description was deleted without even me reading it so let's go over to the list what has been changed (basically everything, heh). - Aspect have been changed from 4:3 to 16:10 widescreen. - Resolution of the workfile has been changed from 2048x1536 to 4000x2500. - Characters have been completly revectored, characters on the two sides are extended to fit widescreen. - Gradients and effects are now used instead simple vector color overlays. - Title has been changed to "Only One Number One" which is now spelled with words, as long the dot in No.1 caused issues with the PSD files. - Colors are now more far vibrant and more toned/gradiented. - The colored outlines are lighter in color and more blended in. - The output JPG file is now in 4k (3840x2400). - Due 16:10, Rabi en Rose and Dejiko has been extended. Again drawn on own, anime is too old (2001-2003) even to get good sources. - The dress of Rabi en Rose has been completly redesigned to the newer one and the heart ornament is now smaller. - Eyes are now more detailed with a slight glow. 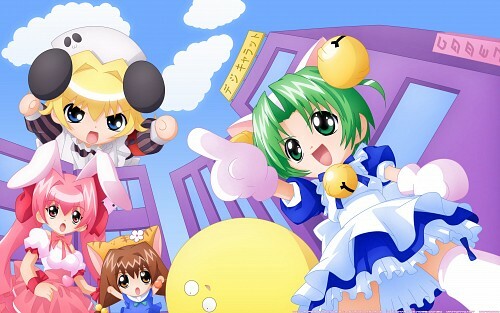 - Distance between Dejiko and the other characters is now wider. - The font on the pink billboard has been changed to "Akihabara Hyper" and says now "Gamers" - the store where the main characters work at. - The yellow billboard now says "Di Gi Charat" in japanese. - Clouds are now more comic styled, gradiented and less random. - Building outlining is now more measured and angles are more logical. The main difference is definitely the brutal change to extremly vibrant colors, but thats how I do things now and thats how Di Gi Charat should look in real. It was actually fun to do this oldie, as long it brought me back to my roots, but I had my current skills to my disposal. Beautiful new koge donbo wallie! omg so many colored lines, i would have died doing those. great job though! A pretty cool wallpaper, congratulations! -.- i say i is cute. nyo! This is so cute! Thank you very much for this great wallpaper!